King Charles Cavalier Spaniel (KCCS) with intermittent mild lameness of hind end presented for additional, non-pharmacological, sources of decreasing discomfort and prolonging progression of joint changes to improve long term quality of life. After three sessions, owner reported that pet is more playful, weight loss program is achieving results, and periods of lameness have decreased. A one-year-six-month-old male, castrated, KCCS originally presented for chronic worsening of mild intermittent lameness of the right pelvic limb in June 2018; owner reported no apparent cause of lameness. Pet has two other KCCS siblings (both younger) and two cats at home that he plays with. Other physical activity consists of routine play and occasional walks; no working, training, etc, in history. Patient is fed Hill’s Science diet adult formula and had been feed the small breed puppy formula until 1 year old. No history of surgery other than routine castration at 6 months old. Temperature, pulse, respiratory were within normal limits for signalment. Pet had a body condition score of 7/9. Grade 2/5 lameness on pelvic limbs. Routine blood work held no significant findings besides mildly decreased platelets (blood smear showed very large platelets) which can be attributed to patient’s breed. Neurological examination showed no significant abnormalities. Orthopedic examination noted medially luxating patella bilaterally; pain on extension of the coxofemoral joints, worse on the left. Myofascial palpation revealed very tight muscles of the superficial gluteal, vastus lateralis, vastus medialis, and gastrocnemius muscles. Radiographs reported mild to moderate laxity of the coxofemoral joints. Grade two out of four medial patella luxation bilaterally; when examined the patella could be luxated with pressure and would remain out of place until manual replacement (Putnam). Hip subluxation; based on radiographs, physical examination, and joint movement, hips were determined not to be completely dislocated but did have abnormal positioning and movement that could not be permanently corrected without orthopedic surgery. Cruciate disease; injury ruled out at this time due to negative cranial drawer / tibial thrust, no soft tissue swelling apparent caudal to patellar fat pad; however, owner informed that laxity in these soft tissues might not be appreciated at this time and could develop further. Nerve entrapment: no deficits revealed during neurological exam. Recommended acupuncture for neuromodulation of tissues influencing coxofemoral and stifle joints. This would be accomplished via stimulating the local nerves (sciatic n., cranial gluteal n., femoral n., etc) to influence mechanoreceptors and nociceptors that can lead to effects on the central nervous system to provide analgesia, decreased inflammation, and promote healthy muscle growth of these areas being treated (Robinson). Patient was started on daily joint supplements of glucosamine, chondroitin, and omega fatty acids. A weight loss program was also recommended. Treatments were recommended weekly and / or during periods of lameness / increased discomfort. Patient receiving therapeutic laser treatments at another facility. • Pet became mildly agitated after stifle points placed therefore no further needles were placed. 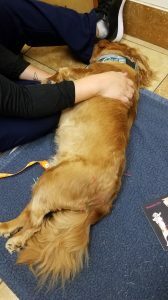 Owner reported that after each session pet experience mild lethargy for the rest of the day which was attributed to normal effects of acupuncture treatments. Owner reported that in the days to weeks following treatments, pet was more active, playful and incidences of mild lameness decreased from once a week to once every few weeks; duration of lameness decreased from lasting a week or more to lasting a few days. Serial examinations during treatment (which lasted over course of 3 months) showed decreased resistance of pain during flexion and extension of coxofemoral joints, no pain on flexion or extension of stifle joints, when presented with lameness was decreased at a grade 1/5. Pet also decreased weight by 3 pounds – attributed hopefully to pet’s willingness to play more as owner admitted had not been strict on calorie restriction. 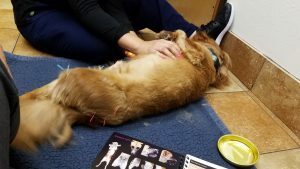 Overall, these three treatments of dry needling (with conjunction of laser therapy at the other facility and joint supplements at home) appeared to cause the pet’s discomfort to decrease as well as improved his short-term quality of life. The majority of animals diagnosed with patella luxation occurs around six months of age (Nunamaker). Long term study with continued treatment might be useful to determine whether early treatment of patellar luxation in young animals may decrease the progression of this ailment and thus decrease the need for not only pharmacologic pain management (nsaids, opioids) but also eventually decrease the need for surgical intervention in the later years. Putnam: Patellar Luxation in the Dog. Master’s thesis, University of Guelph, 1968. Robinson, Narda: One Medicine, One Acupuncture. Animals.2012, 2, 395-414.